I’ve been warning you all along we were going to get to this point. A “sequential” portfolio is very different from almost every other type of portfolio in that it’s about telling a story, not about how pretty the pictures are (though that can be part of it). We’ve talked about delivery. Sure, we can dicker about whether or not you’re going to be presenting the thing as a series of originals, printed pages, or digitally–but when it comes to sequential art all that becomes secondary (or maybe even tertiary). What matters with sequential art is telling the story, and doing so quickly! And I mean quickly. I didn’t get this for a long time. The fact is, I have made a lot of mistakes along the way, and probably will continue to make mistakes in the future–but I’m learning. Hopefully someone out there reading this may glean something from my mistakes. And I’m not claiming I picked this all up on my own. Got a lot of this advice from friends, and it finally started to sink in a few years ago. Be Dynamic! For pete’s sake, this is comics. The reason that super heroes, zombies, ninjas, and the like abound in comics is that they tend to look really good on the page. There’s a place for “sitting room drama” but thus far that genre has not found a solid niche in the world of comics. Keep it neat. Actually we dealt with this one before in all those other posts I wrote. It should go without saying, but if you can’t present a neat portfolio to the buyer you’re just saying (without words) that you’re disorganized and probably incapable of staying focused, meeting deadlines, sticking to scripts, turning in vouchers, and a world of other business practices that publishers are expecting freelancers to engage in–besides simply being able to draw. Okay, that’s what you present. As for how you get to that point–well, you don’t do it like I used to try to do it. That is, you don’t set out to draw ONLY the 3-5 pages that will impress. I used to try and either dream up a twenty+ page story and then think I could do a really good job if I spent all my time drawing only the best pages in the middle. It doesn’t work that way. It never did when I was starting out, and it still doesn’t work that way now, some thirty years later. There is such a thing as “creative momentum”. I find that if I draw the entire twenty+ page story that somewhere in the middle there will be a few rare gems. Not that all the rest of the pages stink, but there’s always some little glitch on a page that I find in review. And it’s almost always something that I know will actually get worse if I keep fiddling with it. So it’s a matter of finding the pages with the least glitches. Then it’s a matter of finding 3-5 pages that work in a sequence from start to finish; a clear little bit of story that makes sense visually even though there are no word balloons or captions to indicate what’s going on within the story. But the point is, I’d never have that 3-5 pages of “rare gems” if I hadn’t drawn the whole twenty+ pages to start with. That’s the advantage of having assignments to work on in the first place. I know, it’s a Catch-22 situation for the young artist. How can you get assignments without good samples, and how can you get good samples without assignments? I get that. The trick is you have to create your own assignments. Or work for peanuts–or for nothing–in order to have the experience under your belt that leads to good samples. It’s a sliding scale too. “Good samples” in the eyes of one editor may be barely passable (or worse, complete garbage) in the eyes of another. But this is where we find ourselves in the world, and also how we find our voice in our chosen field. The practical application I can explain to you: 3-5 pages of dynamic work, presented simply and neatly. What the creative content of those pages will be like is left entirely up to you. So, rather than trying to send out a million emails (feels like I’ve already done so, but probably not really) dealing with the events of this past weekend (October 9-11, 2015) at the Greenville, SC meeting of the Southeast Chapter of the National Cartoonists Society–figured I’d just write a blog and then direct people to look at this when it’s done. Makes sense, right? Well, somewhat. If you’re one of the SECNCS who was there, keep in mind that these are my impressions of the event–even though I’m chairman, these are not in any way intended to be official minutes. You may have gotten a different impression entirely–chances are, you did. If you’re one of the SECNCS who was NOT there, so sorry you missed the fun. If you are NOT an SECNCS person, then you’re welcome to read along and maybe get an idea of what makes cartoonists tick. If you like what you read then maybe you’ll be moved to join our inky little corner of the world. It’s all good. Okay, so starting many months ago I began planning this event with the help of a lot of people. In particular, John “Shep” Sheppard, SEC vice chairman, and Tim “Mr. Ollie” Oliphant. In addition to those guys we had help from Steve Haynie (who really needs a nick-name that will stick), Tom Littlejohn, and Rex Gray–who all live in the Greenville area. I won’t bore you with the wearisome details other than to say that they are the kind of things that tend to take all the fun out of this sort of event up until the event actually happens. But the event got planned, and not trying to give anything away here (spoiler warning!) everything came off very well–that is if people gushing about how great it was and how much fun they had is any indicator. Here’s how it went down. I rolled into Greenville about 1:30 on Friday afternoon. I’d hoped to be there earlier, but a traffic jam at I-26 in Asheville (said “jam” is now something like that storm that has been raging on Jupiter for hundreds of years, just so you know) kept me behind schedule. So I missed lunch as we were scheduled to meet at the Greenville Children’s Hospital at 2:00 pm. So lunch for me was a granola bar and a bottle of water. Not bad as lunches go, but I’ve had better. After we were done there, in about an hour, we wandered back to the parking garage and headed over to the Embassy Suites Hotel. It was a lot grander than I’d imagined. To me it looked a lot like the hotel that Mel Brooks stayed at in “High Anxiety”, but nobody else mentioned that. Many of the group had already checked in, including my roommate for the weekend, Mr. Ollie. So I got my room key and went upstairs to see what the place looked like. Wow. Huge rooms. We got a sleeping room with two double beds and a “sitting room” that we could have used as an office! In fact, we probably should have. Tim and I were able to hang out a while and catch up before heading downstairs to check out our meeting space for the next day–the “Columbia Room”. It was not yet set up for our group, but we found where it was so we could direct people there the next day. We met a few of our group in the spacious lobby and enjoyed “happy hour” with free sodas and snack foods for a while. We talked with various other cartoonists as they arrived. Among these were Jack “Cass” Cassady and his wife, Brenda, and Shep showed up too. Pretty soon it was time to get people lined up for the hotel shuttle that would take them over to our Friday night dinner at Happy China–just a mile or so down Verdae Boulevard. But Mr. Ollie and I had a different task ahead and left it up to Shep to get people on board the shuttle–we had to go pick up Barbara Dale (our keynote speaker) at the GSP airport. Now, I don’t want to say anything bad about Mr. Ollie but…(if you know Tim you’ll get that joke)…he’s a real neat nick sort of bachelor, so when he saw the condition of my own car with the remains of the clutter that usually abounds there he was pretty amused. I thought it was pretty clean myself. I had missed a large tablespoon that my wife, Karin, had left in the floorboard between the front seats. So I went into my, “look who’s car is so neat, Mr. Ollie, who doesn’t have any stray spoons in HIS car,” routine. We traveled in an odd silence for a while after that. But then again GSP is only a few minutes away. I still like GSP as an airport because it doesn’t look like an airport. Tim mentioned that it looks a lot like a community college campus–and he’s right. You can’t see the flight line from the terminal at all because of a stand of trees all around that area. Unfortunately it seems that word has gotten out about GSP being “the international hub that feels like a little airport.” And so they’re expanding it. I’m afraid it will soon lose much of its charm. In fact it already has as you can no longer go upstairs to meet arrivals like just a year or so ago. Oh well. Barbara’s flight was on time and we soon greeted her by the luggage claim on the main floor. Tim was primarily responsible for us being able to get Barbara, as they’d known each other for some time. It was the first meeting for Barbara and myself–and it was very pleasant. I went out to get my car from the parking garage while Tim helped Barb with her luggage. In a few minutes I was able to repeat my “spoon in the car” routine for Barb (a much more receptive audience than some people already named) which put her at ease–we were nuts too! We returned to Embassy Suites so that Barbara could check in and Tim could bow out of dinner gracefully (he does not handle soy well in any form). Then I drove Barb over to Happy China in time to meet the rest of the gang that were just beginning to have their drink orders filled (some were still contemplating what to eat). It was a good time. We had lots of good conversation–mostly good news, some bad, from the preceding year or so. Were all shocked to hear that Chris Schweizer had to be taken to the Atlanta hospital that evening (hope he’s doing better now, haven’t heard) when Stephanie got word via text. I’m not going to get this list right, but let me see–at the table besides Barb and me were: Shep, John Lotshaw, Vicky Smart, Stephanie Gladden-Miller, John Miller, James “Southpaw” Aikens, Tom Littlejohn, Rex and Val Gray, Cass and Brenda, John and Karen Rose, Mike and Karen Morgan and a couple more I think…sorry, too much soy sauce has blurred my memory. Back at the hotel everyone hung around the lobby for a while. My big moment was misdirecting everyone by gesturing with my left hand while saying “our meeting room is through the lobby and to the RIGHT.” Oops. Wrong right. Don’t pull this sort of thing with a room full of cartoonists–they will call you on it. There was a lot of good-natured give and take. The thing about cartoonists is that we speak the same language! When we’re together–no matter how divergent our views on various matters–we get one another somehow. We compare notes on favorite movies, TV shows, foods, etc. all with a lot of mockery and self-mockery. It’s just great to get out of the studio and talk with someone else that understands. Eventually we all realized that the business meeting came early the next day, so off to bed. I don’t know how anyone else slept, but Tim and I both had a rough night of getting used to having another 50-something guy in the same room. He says I snore. I say he snores worse. It did not come to fisticuffs–but we were both pretty bleary at breakfast. BTW, the Embassy Suites has a complimentary breakfast that is as complete (and better) than that I had on an ocean cruise. So, if you stay there make sure to plan for that. Great food, and lots of it. Once again we met many others in our group as they arrived, and had a time of sharing. But Shep, Tim and I had to go over our pre-meeting notes to make certain everything was planned out so that the business meeting wouldn’t take too much time and set the rest of the day back. We also had to get our signage put up in time to direct people our way. The Columbia Room was set up to order with classroom seating for 60 or more, a computer projector and screen, as well as podium and microphones–but it was little hard to find until we put up our signs. With minutes to spare I ran up to the room to brush my teeth and return to call the meeting to order. Or rather what passes for order with a group of cartoonists on a Saturday morning that begins with the passing out of MoonPies. Let’s face it, most of us are in our middle years and Saturday morning sugar rush is not part of our routine anymore. So eating MoonPies at 9am is a bit of a shock to the system. Add to that the fact that many of us had slept little the night before and you’ll have a notion of what things were like. This is one reason we print out an agenda ahead of time. We had to make nominations for Secretary/Treasurer this year (we now stagger our elections so that no change over of leadership leaves us with all new officers) and Tim Oliphant was the sole nominee this time. He’ll be sending out ballots with his name and write in slots for all the full NCS members to return and be tallied by Shep after the New Year. We got a lot of good suggestions for possible venues for next year’s meeting: Cherokee, NC, Cleveland, TN, Roanoke, VA, Huntsville, AL, and Helen, GA, Charlotte, NC were all among those suggested. I’ll be taking more elaborate proposals from those who suggested them and making a decision once I have more information. It’s a complicated process to figure out this sort of thing–cost of guest rooms, meeting space availability, convenience for our members and guests. But it will get figured out–eventually. We also had a few awards to hand out. Greg Cravens was this year’s recipient of “The Meglin” for his work in coordinating the NCS Foundation’s launch of “Cartooning for Kids” at the Memphis Shriner’s Hospital. Greg put a lot of time and effort into that event when it was not possible for any of our chapter officers to be there. He says he’s going to put his “Meglin Award” next to his “Tim Rosenthal Award” in his studio. A fitting place for it, since both are for volunteerism within the Southeast Chapter. The NCS has created a new chapter award, the “Tom Gill Award”, this for outstanding work educating children about and through cartooning. We officers had to think long and hard about this one, and finally came to conclusion that Sharna Fulton should be our recipient for 2015. This was actually the very first Tom Gill ever awarded! Unfortunately Sharna could not make it to the meeting as she’s just recently moved to Denver, CO with her husband. But we still wanted to honor her for her past work within our chapter, and so Mr. Ollie accepted the award for her. Last (but far from least) was the 2015 “Jack Davis Award”. This is our chapter’s lifetime achievement award for work in all manner of media, and so it went to our keynote guest Barbara Dale who’s made her name in greeting cards, but has also worked in comic strips, licensing, and is now moving into written fiction (with a lot of illustrations). I don’t know who was more thrilled, our group for giving her this honor or she for accepting it. But Barb bounced back, and with the help of John Lotshaw soon had her powerpoint presentation ready for us to see. Prior to the event Barb requested that no one under 18 be admitted to her program because of some of the language she has used in her cards and would use in her presentation. I got some negative feedback about this decision. But my response to that was that I did not feel it was my place to edit or censor Barbara. She offered the request and we emailed back and forth for a few hours one day about it. She could edit herself if she wanted, or we could put the warning on the program–either way–it was up to her. Ultimately she asked for the warning and I have to applaud her for that. I don’t agree with everything she said, nor do I approve of the language she sometimes uses in her cards or in her presentation. But it’s not up to me to make those decisions. But you know what? I still really like Barbara. She may swear like a sailor (and she fully admits that sometimes she does) but she’s a really nice lady and I’m glad I’ve gotten to spend some time with her sharing this inky profession. Kate Salley-Palmer does NOT swear like a sailor. She was our second speaker, and even though we don’t see eye to eye politically she did a great job covering her career as a political cartoonist turned children’s book writer and illustrator who is now returning to political cartooning. And you know something else? I really like the way that she draws. She has a really neat style. I also like her interest in illustrating South Carolina history for children, and her gracious Southern manner. We then took a break for lunch. I stuck around the meeting room guarding the various items in the silent auction for most of that time–and just relaxing a bit. There were some really nice pieces of art for sale–including two pages of Peanuts comic book art donated by Robert Pope, and an original Brenda Starr Sunday page from June Brigman and Roy Richardson! There were a lot more cool things, but everyone agreed that those three were the stand out pieces of the auction. After a while Shep came in to relieve me from guard duty and I ran out to grab some lunch (and pick up some to go for Shep). Most everyone was dining at “The 19th Hole” (did I mention that Embassy Suites is also a golf resort?) and I sat down briefly with Stephanie and John, as well as old acquaintance Ashley Holt–who promptly offered me half his turkey club sandwich (large portions at The 19th Hole). I was just getting into my litany about Atlas/Seaboard Comics from the 1970s when the to go order arrived and I was off to relieve Shep in time for our afternoon programming beginning at 2pm. Something that struck me during the discussion were that I actually began to assimilate the idea that we cartoonists do share a language–and that’s why we get along so well in spite of differences of opinion and beliefs. I’d heard it said (and even mentioned it previously in this blog) but there’s a difference in knowing it and feeling it down inside. That’s kind of cool to have taken away from the event. The other thing was we had been talking a lot about some of the difficulties in dealing with younger cartoonists in recent years. An almost dismissive quality that some have toward the notion of editors, art directors, etc., that they will take their art on the web and get recognition that way. While we all agreed that we were no different when we started out–at least not in attitude–there is this sense of shut off when any of us older cartoonists offer feedback. June Brigman put it this way: Many of these kids have been trolled something fierce while online and so it’s not that they’re shutting US out particularly, but after a few vicious trolls they close their minds to any criticism at all, positive or not. While that doesn’t change the nature of criticism, it does help me better understand ways in which I can better approach “the millennials” I meet in the future. For the record, all you millennials out there who are cartooning: we not out to get you. We truly want to help you develop your work. Don’t shut us out. Bring us your work and we’ll do what we can to help you develop into better artists and storytellers–give us a chance. As the panel finished up Qiana took a moment to plug her next big event–a forum on comics at USC April 14-16, 2016. So be looking for more information on that in the future. Sounds like they’ve got a good line up of creators. The auction concluded early (by mutual consent) and the final tally was $500. I think this may be the best we’ve done since we were in Savannah and had contributions from all the MAD Magazine crew. So $250 of that is going to the Children’s Hospital, $125 to the Milt Gross Fund, and $125 to the SEC to cover some of our expenses. Just as we were finishing up, Shane “ShaneHai” Harris showed up. I’d been giving Shane directions via text during the day and, well, it’s my fault he got lost. At least he made it, and was able to show his samples to many of the people who gathered in the hotel lobby before dinner (another happy hour–this time I had a Shirley Temple!) Shane was able to stick around for dinner with us at City Range Grill. Here’s who was there. Shep, Tim O., Stephanie and John Miller, Cass and Brenda, Carol and Leanna Rasinovich (Cass’ daughter and granddaughter), Southpaw Aikens, Rex and Val Gray, Tom Littlejohn, John and Karen Rose, Steve Haynie, Sharon Kopstein and Bill LaRocque, Greg Cravens, Vicky Smart, Barbara Dale, John Lotshaw, Bill Holbrook, Roy Richardson and June Brigman, Tina and Dan Bentrup, ShaneHai, and myself. In other words, right at the 30-32 the room could hold. Dinner was really good–for me anyway. I had the best crab cakes ever, and since it was my birthday indulged in a big slice of key lime pie. But it was really dark in there–too dark for a bunch of bifocal wearing cartoonists to do much cartooning. So we all soon headed back to the hotel and hung around the lobby some more. Swapping favorite movies (apparently all cartoonists love “Dirty Rotten Scoundrels”) and tales of brushes with greatness. (Barb once stayed in the Francis Ford Coppola Suite on a trip to NYC’s Card and Licensing show. I once stayed in the Fred Kirby Room of a Charlotte Bed and Breakfast.) We passed around more samples and talked about stuff like Steak n Shake (which gets mixed reviews, but not from John Lotshaw and myself). Anyway the talk went late into the night. We could afford to sleep in on Sunday as check out wasn’t until Noon–but some had to get on the road early (Greg and Tim for instance had to drive back to parts of Tennessee that are in the Central Time Zone). So we parted ways for the evening–promising to meet for breakfast, “if I’m up by then”. Tim and I had a better understanding of one another’s sleep habits on Saturday night. (We both piled spare pillows on our heads and slept the sleep of the exhausted). A few of us met for breakfast in smaller groups. But something odd was happening. Many teens and early 20s were showing up, making the place look more and more like a comic convention–seems the Embassy Suites had rented their main meeting room to a group of Pokemon enthusiasts and they were crowding the lobby playing collectable card games! If only Shane had been able to stay over he’d have fit right in with his GI Joe trading card art. Oh well. Around 11 I got my stuff packed up and headed home to the mountains. It was a pleasantly sunny day (after a rainy Saturday) and a truly nice drive back home. I’m going to miss all you cartoonists. But I’m going to need to rest up for around a year before I’m ready to officiate again. I will say that all the kudos received have enlivened me again. I think I can handle putting one more of these things together before turning in my chairman’s gavel. Now, you’d think I’d have done a lot of drawing during the weekend. And I did do considerable, but only kept one. I’m going to post it with this blog. So, it’s interesting to find myself touted as “famous” in various venues lately. I suppose it’s so in a limited sense. I have got 30+ years of credits in comic books and illustration, true. I can generally go to almost any comicbook convention and ask for guest status (I may not get it, but I can ask without massive shame). “Guest Status” is a variable term. Minimally that means I can either get a guest pass for free. For San Diego, I have gotten a free pass, rather than paying the $150 or whatever they charge people in general, a.k.a. “fans”. At other shows I can expect a pass and a table space for free. This is helpful when trying to make money selling prints, contributor copies of books I’ve drawn, character sketches, and original art. Still other shows guest status means that they’ll pay for a hotel room, table space, and a free pass–to do all of the above without losing money on anything but gas and food for the weekend. The latter version of the term has been (thankfully) happening more lately. Still not making that much money. There’s a better version of “guest status”, wherein they fly you to the show, pay you to be there, give you hotel, table, food, etc. I have yet to attain such status, and have my doubts that I ever will. But I’ve been surprised before, so who knows? I’ve done several shows with guest status lately. Lost money on one show, did okay on another (didn’t lose money, maybe made a little). But now we get into the strange area that is the past several weeks and the next few coming. I’ve been asked to participate in the local “artists invitational” show held by my hometown arts council. It’s a true honor to be asked and I’ve got 6 pages of comics hanging in a show that includes all sorts of locals, both native and retirees to the area. So if you find yourself in Waynesville, NC tomorrow evening (or over the next couple of weeks) Gallery 86 on Main Street is hosting the event–and the reception is tomorrow night 6-9 pm. I’ll be there attempting to look cool, but frankly, it’s really not my element. Comics is a strange hybrid–to commercial artists it’s kind of a fine arts thing, while fine artists look at it as terribly commercial. So even getting wall space at this event is a moral victory of sorts. (I will say that the artists who set up the show are not snobbish at all, great folks, but there’s no telling what kind of crowd will show up for the reception. There may be all sorts of pretentiousness, there may not–we’ll see). As if that were not enough to potentially swell the head, I’ve been asked to come to Knoxville on Saturday and kick off the start of their local cartoonists group. I’ve been pushing for this to happen for years, but it’s finally coming together and I consider it one of my crowning achievements since taking over the chairmanship of the Southeast Chapter of the National Cartoonists Society. 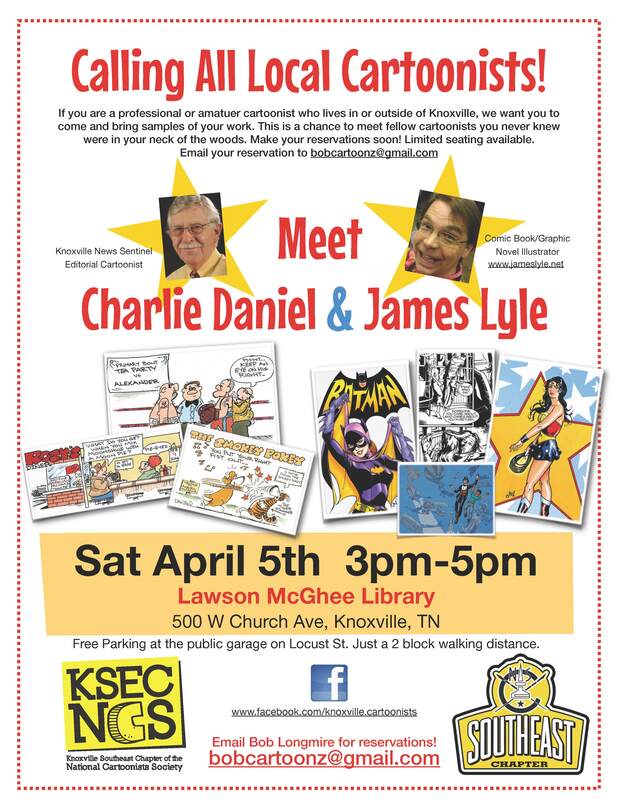 I was just going to show up but they gave me star billing along with Charlie Daniel who draws for the Knoxville News-Sentinel. I’m really not a big shot. I don’t consider myself a big shot. I’ll begin to believe that perhaps I am a big shot when I can pay my smart phone bill without breaking a sweat. No, check that, when I can book a flight to an important event and not have to put my entire life in hock to do so. Following up on the last post about the term understanding–but with a bit less philosophical bent. What amounts to a squiggle of ink can become a lock of hair. A curved line a hip. A series of parallel lines fingers. Two dots become eyes. But to suddenly change these can confuse or shock the reader. Though such shocking effects can be used from time to time to surprise the reader, it’s generally more important to maintain the visual idiom throughout the work. For the cartoonist this may threaten to become tedious. So much of the work of cartooning is finding ways to make those established visual idioms interesting to draw. The other part is figuring out which ones work well together–these are the components of style. Just posting a short note today as I’ve still got prepping to do for Christmas (as do so many others out there, I’m sure). 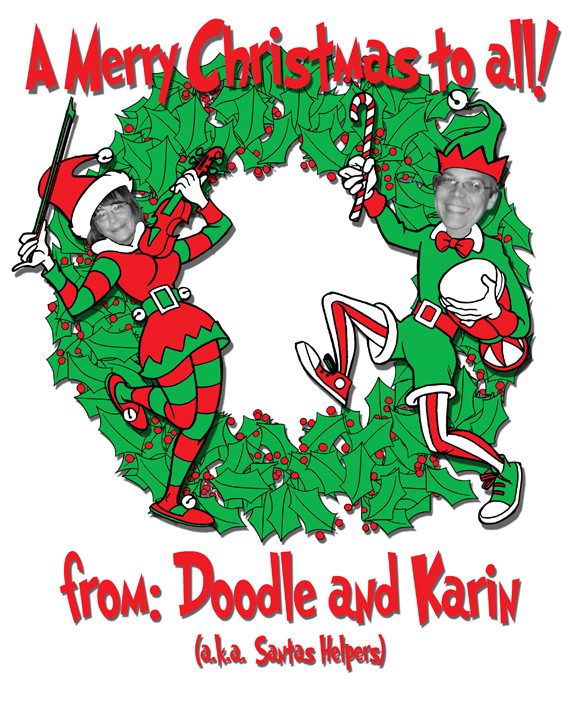 But didn’t want the day to go by without sending out a Christmas greeting. Been using this same graphic several times this year, because there has just been so much to do. So I originally used it on a poster for Gypsy Bandwagon’s performance at Classic Wineseller–a shop in our home town that has been very good to us as a band. While we didn’t have the number of attendees that we have had on Saint Patrick’s Day, or July 4th, the crowd we did have were very generous and tipped us well. The poster included similar images of our cohorts, Lance and Carissa Moore. Now I’m using the graphic for today’s greeting. I don’t want any of my fellow Christians to think I’m trying to go all secular by the use of the elf graphic. These things just hit me from time to time, and I have to go with inspiration as it is supplied. This year it was elves. But I do wish everyone a Merry Christmas and hope that they do recall that the prime importance of this season is as a reminder that God took on the form of humanity in order to save His people from the curse of sin. Keep in mind that even though we celebrate this season (in all manner of forms, some more proper than others) that in a way we’re celebrating Christ’s humiliation. He was simply humbled by being tortured and killed on a cross 30 some years after his glorious birth–He was, in fact, in the process of dying from the moment of his conception. He was born to die in the place of lost sinners. And a lot of people have made a huge deal out of the sign in the heavens, trying to discern if it was a comet, a supernova, etc. But the real sign that Jesus Christ was exactly who He claimed to be is that He rose from the dead. One really can’t separate Christmas from the Resurrection. Oh, we humans try–oh, how we try. But it can’t be done. So, a Merry Christmas to all. That is, I hope the knowledge that God loves you so much that He was willing to take on this humiliation for the sake of your possible salvation brings you joy and peace. Presents under the tree are nice, but the greatest present of all was hung on a tree to die, and then rose again. I’m so very glad that so many of you folks showed up for this event–because, let’s face it–it’s a bit like throwing a birthday party for myself… and if nobody showed up it would just be sad. Actually this event has more to do with birthdays that it may seem to on the surface. You see, Back in August of 1968 my Uncle, Reuben Mendez, showed up for my oldest brother’s birthday bearing a handfull of comic books. I actually have those comics here–well, reasonable facsimilies–the original copies were pretty beat up by the time I got through elementary school. In 1968 comic books cost 12¢ a piece. Uncle Rube (who always had a knack for showing up with the BEST presents for little boys) brought copies of Batman, Detective Comics (also starring Batman), Superman, Superboy, The Flash, and Justice League of America. That’s 6 comic books. An investment of 72¢…plus tax, which in those days was 3% (I checked), so that’s 2.16¢ tax and they rounded up–so 75¢ total. There were certainly other gifts that day, but I could have cared less. Uncle Rube spent three Quarters on this particular gift and my entire life was affected. So the lesson here is small things can have big effects! I’ve spent most of my life in pursuit of trying to create something that moved me in the way I was moved that day. Enough reminising for now! They asked me to talk about what I do. So that we can get to the music part of the show, I’ll try to sum this up quickly and if you have specific questions you can ask them during the reception. When I tell the average person I’m a cartoonist, they almost always ask, “Any specific paper you work for?” And I have to tell them that I don’t work for any paper; that I draw comic books because I want people to know when I’m lying to them. That usually shuts off the conversation pretty quickly. I see that twinkle in the eye when they ask what paper I work for and know that more that likely they want to start a conversation about politics. And I just don’t like to argue that much. I still view comic books as being a kid’s medium–optimally. In spite of the fact that I’ve done a lot of comics that were not intended as children’s literature I’d still like comics to be something that kids can read–just the way I did when I was 4 going on 5. Good guys versus bad guys–you can add sophisticated ideas if you like, but as far as I’m concerned comics were better when they were kid-friendly. I’d really like the opportunity to do more of those, not juvenile per se, but rather books that work for both kids and grown ups. Seems like few know how to do those sorts of stories these days, and the world is a poorer place for it. I’m working on trying to bring those comics back. There’s another group of people that I meet–this second group wants to know how to do what I do. If the first group are those I’d rather not get into a conversation with, the second group probably wishes I’d shut up. I’m way too enthusiastic about drawing comics, and can talk for hours on the subject. Some of the people here today (particularly my wife, Karin) can attest to that fact. But I’m going to try to explain what I do in a nutshell. “Cartoon” refers to a type of drawing that emphasizes line work. Because of my prediliction for depicting things in outlines, I am a cartoonist. “Illustration” apparently refers to any work that is figurative and isn’t fine art–as defined by a lot of people I consider hopeless snobs. Sorry, but illustration was considered a legitimate fine art until less than a hundred years ago. So somebody has got it wrong, and it’s not me. “Comic Books” are acting on paper (or in pixels with the newer means of delivery), which one creates by using cartoon and illustration techniques. The three are not synonymous–but are closely interconnected, and any comic book artist worth his or her salt engages in all three at some point or another. So, in order to be a comic book artist (or graphic novelist, or sequential artist) one must know how to draw, certainly, but also how to act. So I tell students (defined as anyone who wants to draw comics) that they 1) need to draw a lot, 2) in the process learn anatomy and perspective, and it really helps if they will 3) get some stage time. Because in comics you have to play all the parts, as well as direct, and design all the costumes, props and sets. That’s a lot of work, isn’t it? No wonder it’s taken me so long to get to this point! So if you’ll indulge me, I’m going to get some stage time with Gypsy Bandwagon–I’ll be playing the part of the percussionist.